Jones Farm Produce has been growing fruits and vegetables in the Willamette Valley for over 6 generations. In the late 1800’s and early 1900’s our relatives, the Lafollette’s, where growing about 400 acres of peaches in the Willamette Mission Bottom which is about 5 miles from our current farm. They sold many of the peaches at their farm stand but also shipped a large amount to the Portland market to be sold. In the 1920’s Britt and Elva Aspinwall began growing and selling peaches on the corner of River Rd and Waconda, about 5 miles North of Keizer. He sold peaches there at his roadside stand through the 1950’s. Then in 1941 Britt and Elva’s daughter Evelyn married Ambrose Jones and in 1954 they purchased a small farm in Brooks, Or. Ambrose and his wife Evelyn built a house on the farm and had three children; Carolyn, Robert and Richard. On the farm Ambrose planted peaches, apples, cherries, pears and prunes. In about 1958 Ambrose and Evelyn acquired a second farm about a half mile up the road from Evelyn’s father Britt Aspinwall. There Ambrose also planted peaches, apples and cherries. He sold the majority of his fruit to the local public at his road side fruit stand on the family farm. It was hard work but Ambrose was able to provide a good living for his family. In 1977 Richard Jones had graduated from college and came back to the family farm to help his father Ambrose and Brother Robert with the growing business. Together the three of them worked hard to expand the family farming business. In the early 1980’s Robert Jones purchased a third farm about a quarter mile up River Road (today this is where our Jones Farm Produce fruit stand is located). At this time Carolyn Jones became involved with the farm operations. As business continued to grow the farm needed to expand once again so Richard built a peach packing facility and road side fruit stand on the River Road property. There he began to sell the families fresh picked fruit to the local public and also began shipping apples and peaches as for as the Oregon coast, Eastern Oregon, Washington and California. 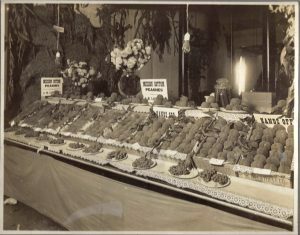 The farms wholesale market was very important to the family business but growing and selling quality fruits and vegetables to the local communities in the Willamette valley would continue to be the priority of the family farm. In 2000 Richards son Matthew returned to the family farm to help with the growing business. The tree fruit business was still strong but Richard and Matthew saw a need to branch out and start growing different varieties of fruits, vegetables and berries. 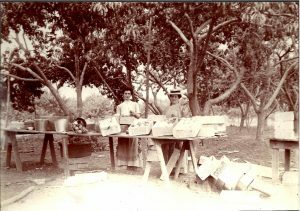 With the peaches, apples, cherries and the addition of the new fruits and vegetables, the Jones farm Produce stand was becoming very popular with the local communities. We now grow fruit and vegetables for local school districts, hospitals, bakeries, grocery stores and other fruit stands and farm markets. We offer many new local products such as flavored honey, fruit jam and syrups, local gourmet foods and our popular ice cream shop. We serve fruit milkshakes, sundaes, short cakes, waffle cones and ice cream cones. The Jones family has been farming in Oregon’s Willamette valley for well over 100 years and we have had many challenges but we have been able to continue to move forward because of our commitment to growing fresh healthy fruits and vegetables and by keeping our customers satisfaction a number one priority. Peaches being sold at a roadside stand. 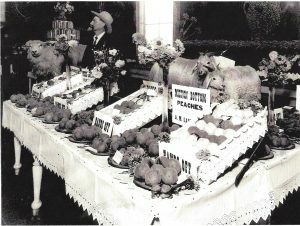 County Fair Peach display in the late 1800’s.